You guys are awesome....thank so much! You made my Mom's day! Thank you. 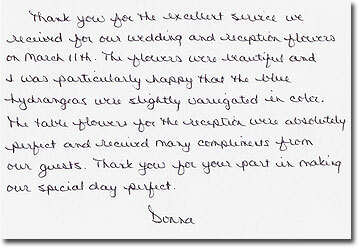 Your arrangements are always beautiful, perfect and delivered on time. It's wonderful to have a florist you can consistently depend upon. Our company has used Jacobsen's for the past eight years and we are very pleased with the quality of their work and timeliness in delivery. I order floral arrangements for our office and for our outside Sales Representatives. 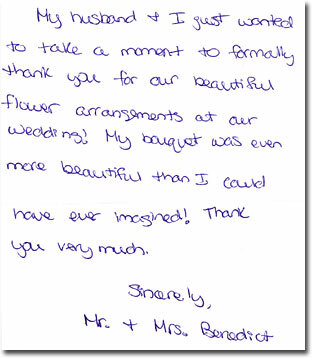 I often receive calls thanking me for the beautiful arrangement and inquiries as to who we use for floral delivery. If there are any issues (which are rare), Jacobsen's has always been quick to resolve in a fair and timely manner. I highly recommended Jacobsen's for the high quality workmanship and their willingness to stand behind what they do. 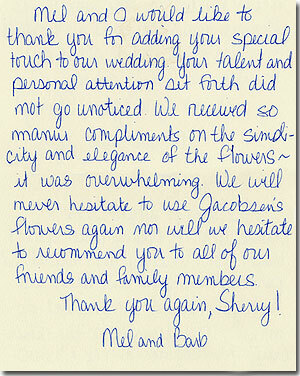 It is with great pleasure that I requested to write a 'reference' letter for Jacobsen's Flowers. Our experience at Christmas for the past 10 years has been that they are very efficient, professional to deal with and use excellent quality in the flowers they utilize. We also use them year-round for birthdays, funerals, graduations and other special occasions. Their designers are top-notch and we always have courteous service when placing an order or tracking one that has been sent out of town. I would recommend Jacobsen's highly. Thank you so much!! My father was so happy with them he cried! Not to mention he and my mother said they were absolutely BEAUTIFUL!! AND, just an FYI, it was reported that the delivery man was especially wonderful and nice....so THANK YOU for making my father's "day" especially special!!!! When we were asked to recommend Jacobsen's Flowers we thought nothing could be easier- because it's something we do on a daily basis. Whether it's a family we're serving or just giving advise to a caller, we suggest them without hesitation. Operating a funeral home for many years, we see flowers from just about every florist in the county and Jacobsens's is by far the finest. Their flowers are always fresh, their designers are creative and their staff couldn't be more accomodating. Jacobsen's well known reputation is not surprising when you see the number of years they've been in business, remaining family owned and operated. We are priviledged to work with them and treasure their friendship. 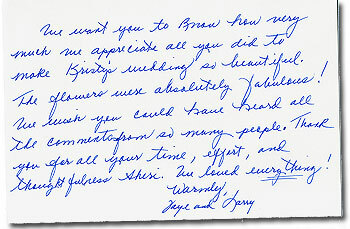 We have been a very satisfied customer of Jacobsen's for many years. With additions or deletions as so often happens in the life of a church it is handled without a problem. You are a pleasure to deal with at any time. We have been doing business with Jacobsens's Florist for over thirty years and they have been painstaking in determining the appropriate floral arrangement for various and sundry occasions. 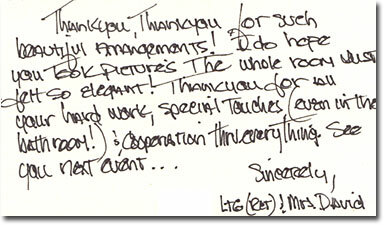 It is this high artistic arrangement quality that has enured to the benefit of this firm on numerous occasions when recipients of flowers have called or written to us to express both their thanks and high regard for the "beautiful" or "unique" arrrangement. Jacobsen's is the best and we unhesitatingly recommend them to anyone in their marketing area. 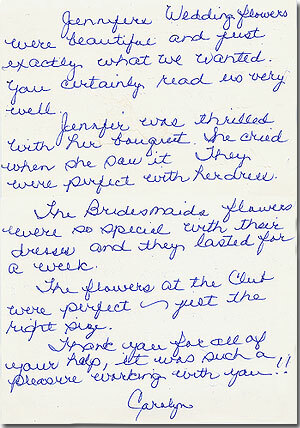 I am writing you to tell you, once again, how beautiful the arrangements were for our Stockholder’s Dinner held at the Huron River Club on Wednesday evening, February 22nd. The table arrangements were perfect. They were the right height size, color and feeling. 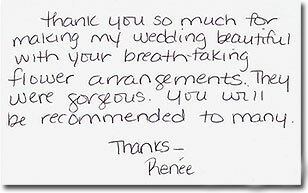 Our guests commented on how stunning they were. The larger arrangements complimented the room(s) and added a softness and bit of color to the surroundings. Audrey, and the entire team at Jacobsens makes my job so easy. They are proactive in their calls to make arrangements – they work closely with the catering director at the function – and there is never a problem. We look forward to working with you again next year. And we thank you. We welcome your feedback! Please send your comments and questions to comments@jacobsensflowers.com.